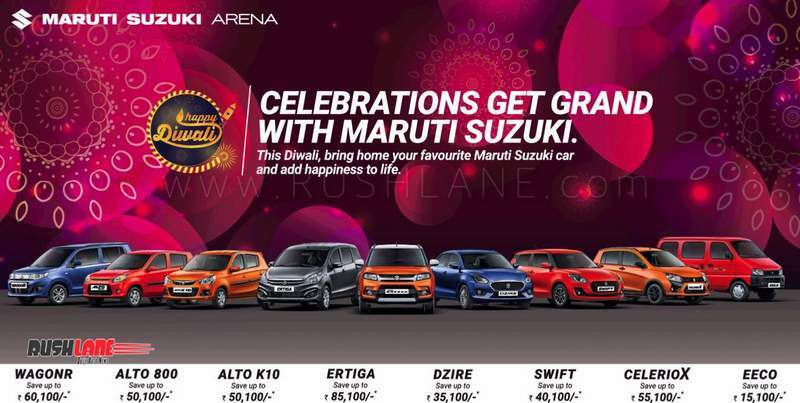 Maruti Suzuki is offering a host of discounts on their range of vehicles through the month of November for the festive season during Dhanteras and Diwali. Maruti Suzuki India Limited is luring buyers into showrooms this Diwali season with attractive discounts and exchange schemes on almost all of its models across variants. The automaker accounts for monthly sales well over the 1.5 lakh unit mark and wishes to boost sales this festive season. The discount on Maruti Suzuki models range go up to Rs 85,000 on the Alto 800, K10, Celerio, WagonR, Ertiga and also on the Swift and DZire. Maruti Alto 800 gets a maximum discount of Rs 65,100 which includes 20,000 discount + 10,000 worth gold coin + 30,000 exchange scheme + 5,100 corporate discounts. The more expensive Alto K10 – AMT gets a discount of INR 60,100 which includes 15,000 discount + 5,000 gold coin + 35,000 exchange scheme + 5,100 corporate discount. The WagonR is being offered at even higher discounts as the automaker wishes to clear out stocks ahead of the new generation WagonR set to make its entry next year. Discounts on the WagonR extend to INR 80,100 and includes 30,000 discount, 10,000 gold coin, 35,000 exchange scheme and 5,100 corporate bonus. The Celerio AMT is being offered at a discount of INR 70,100 while the petrol MT gets a discount of INR 65,100. The company is also offering a discount on the Ertiga on existing stocks while the new Ertiga will come in on November 21, 2018. The Ertiga diesel variant is offered at a discount of INR 70,100 while to attract fleet operators with the Celerio, the company is offering a total discount of INR 60,000. The Maruti Suzuki DZire petrol and diesel variants get discounts while the DZire special edition diesel gets a discount of INR 72,600. The Swift special edition is also offered at a discount of INR 52,600 which includes 20,000 cash offer, 7,500 gold coin, 20,000 exchange bonus and corporate discount of 5,100.